Ka'Deem Carey (left) leads the nation with 15 straight games of at least 100 yards, while Andre Williams is the 16th member of college football's 2,000-yard club. 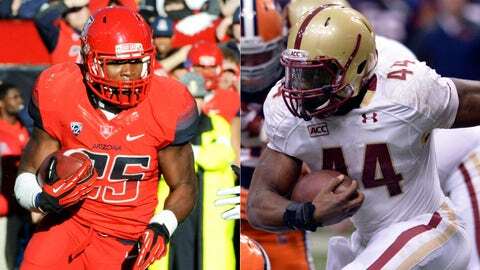 The running backs — Boston College’s Heisman Trophy finalist, Andre Williams, and Arizona’s Ka’Deem Carey — take center stage and so do two rush defenses that haven’t offered up much resistance. The Wildcats are 70th in the nation, allowing 170.4 per game and the Eagles aren’t much better at 152.8 (50th) and both have yielded 16 touchdowns on the ground. But the question is, which one steps up with little question that Williams and Carey could combine for 50-plus touches? Boston College has not seen one player with more than 995 yards rushing this season, while Arizona had faced two (Washington’s Bishop Sankey and Oregon’s Bryon Marshall). But being more tested isn’t a bonus here as Sankey ran for 161 yards and while Marshall had just four, he left in the first quarter with an ankle injury. Both backs should have a big day, but it’s Williams that may have the more favorable matchup against the Wildcats D and keep in mind that 946 of Williams’ 2,102 yards came after contact. That’s 165 more than any other player on a team from a major conference. Chase Rettig. Williams and Carey will get all the attention, and for good reason. But with both defenses focusing on the run, this may come down to watch quarterback is able to take advantage because of it. Arizona’s B.J. Denker is a better runner, with 898 yards and 12 TDs, but Rettig is the passing threat, which will be crucial here. While he threw for 1,804 yards and 17 scores this season, that came largely while handing off to Williams, whose 329 carries were 32 more than the next closest player. Rettig isn’t just a game manager, piling up 3,055 yards last season and he has an underrated weapon in Alex Amidon, whose 67 receptions (for 895 yard and five TDs) were 45.5 percent of the Eagles’ total. The Wildcats’ recent trouble in stopping the pass, allowing an average of 300 yards per the last three games, only helps Rettig’s case. 0: These two teams have never met, though Boston College has seen Rich Rodriguez before, going 2-2 against him when he was at West Virginia. Williams has the better numbers with 386 more yards than Carey, who played in only 11 games. He also doubles up Carey in carries of 20-plus yards (26 to 13) and is averaging 6.39 yards per carry, a full yard more than his counterpart. When it comes to consistency, Carey leads with FBS-high 15 straight 100-yard games, while Williams has three games of less than 100 this year (one he left with an injury). But will get their chances to star, but if it comes down to ways to keep a defense off balance, the nod goes to Boston College with Rettig.